Talking Heads Hair Salon - Directions (321) 984-9795, 5000 Stack Blvd, Suite A-3, Melbourne, FL 32901 A full service hair salon for woman and men - haircuts, hairstyles, coloring, extensions, shampoo, blowdry, perms, highlights, relaxers, up do's, nails, manicure, pedicure. Evenings by appointment. Walk-ins welcome. Take I-95 to exit 176 (Palm Bay Road) East for 1.5 miles to the intersection of Palm Bay Road and Stack Blvd. We are at the North West corner of Palm Bay Road and Stack Blvd. in the Stack Village Plaza. 5000 Stack Blvd, Suite A-3, Melbourne, FL 32901. 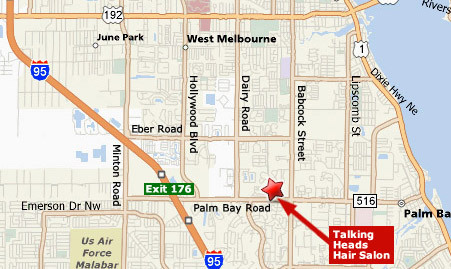 Talking Heads Hair Salon, 5000 Stack Blvd, Suite A-3, Melbourne, FL 32901 (321) 984-9795. Centrally located at the corner of Palm Bay Road and Stack Blvd. in the Stack Village Plaza. A full service hair salon for woman and men open Tuesday to Friday 9:30 to 6:00, Saturday 9:00 to 3:00, closed Sunday and Monday. Evenings by appointment, walk-ins welcome. We turn heads, let us make your hair talk for you! Talking Heads Hair Salon Copyright © 2019. All rights reserved.